In a novel solution to the still-unsolved mystery of the last mile, Wal-Mart Stores on Thursday revealed it was testing using store employees to drop off online orders at customers’ homes on their way home from work. The test got underway a month ago at three Walmart Supercenters — two in New Jersey and one in Bentonville, Ark., officials said Thursday during Walmart’s annual Shareholders Week event. 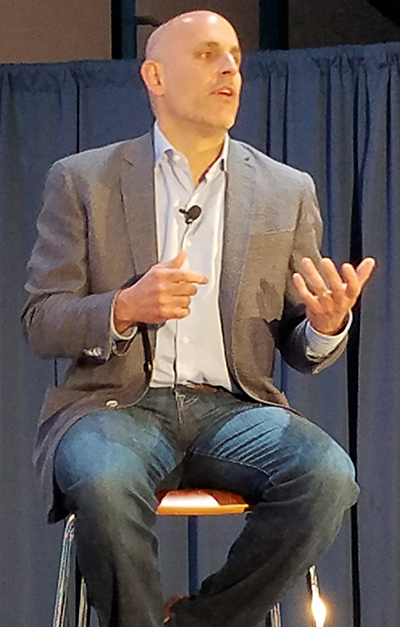 Marc Lore, Walmart.com CEO, said the test takes advantage of unique assets of Walmart -- in this case, a million employees across the country who work in stores located within 10 miles of 90% of the U.S. population, and trucks full of merchandise bound for those stores every day -- and using them to attack costs inherent in home delivery. “We’re constantly looking for ways to leverage Walmart’s unique set assets, and I think this is a great example of that,” Lore (left) said in a presentation Thursday. Here’s how it works: Trucks moving items from fulfillment centers to stores in the test areas are also taking Walmart.com orders to stores nearest the delivery address. Associates at those stores, if they wish, may sign up to deliver them on their way home after their shift. That process is enabled by a specially built app that will assign delivery routes to workers based on their way home. Workers “are fully in control of their experience,” Lore said, setting preference based on which days they want to work, the number of packages they can deliver, and the size and weight limits of those packages. For Walmart, the option of workers making deliveries can potentially be a more cost-effective and faster alternative to using traditional courier services and crowdsourced delivery options like Uber, which can incur additional costs as a result of beginning their journey at a different place than the package.